Exclusive Solar Systems promises to give our customers all the knowledge necessary to make an informative and educated decision in order to feel confident choosing the program to satisfy their needs. To earn our customers' business, not only will we ensure they choose the right solar program but we will beat out the competition by offering the best pricing. Currently, Mr. Dancy is serving as Chief Executive Officer of his company, Exclusive Solar Systems. His mission is to provide total energy solutions and accurate, fact based education that is desperately needed for both residential and commercial energy consumers. 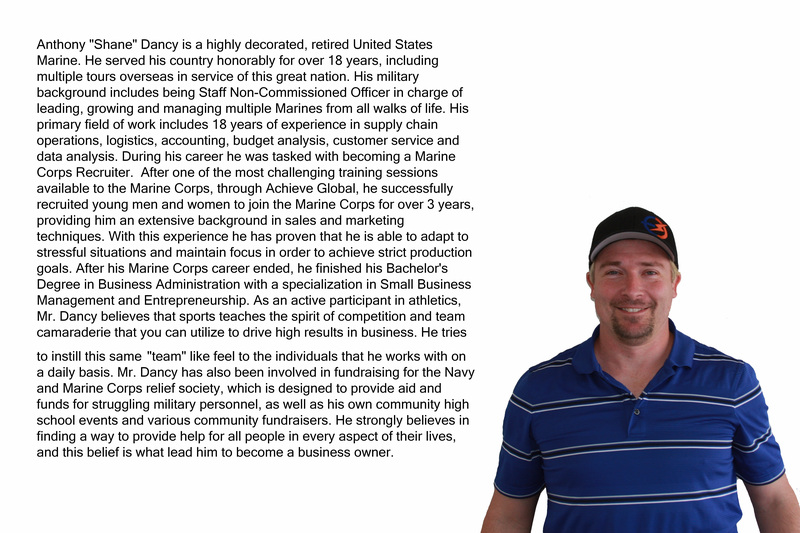 Mr. Dancy is involved with day-to-day operations and activities with his company and is experienced in sales and customer service while providing management and leadership to his team to ensure cost effective operations. Currently, Mr. Freiberg is Chief Marketing Officer and second in command at Exclusive Solar Systems. Alongside his business partner, Anthony “Shane” Dancy, He is dedicated to helping his employees have success by teaching them to Market themselves and give them the tools they need to be successful in providing renewable energy for any consumer. To strive to be the example in quality care and service by ensuring each customer is well-educated on their solar choices, so they can make a confident decision on the program which best fits their needs. Michael Roberts is a 6 year United States Marine Corps veteran. He served his country honorably, including tours overseas to Iraq and Afghanistan. During his time in the Marine Corps he was quickly promoted and served as the Non-Commissioned Officer In Charge of the Administration and Personnel division for his unit. 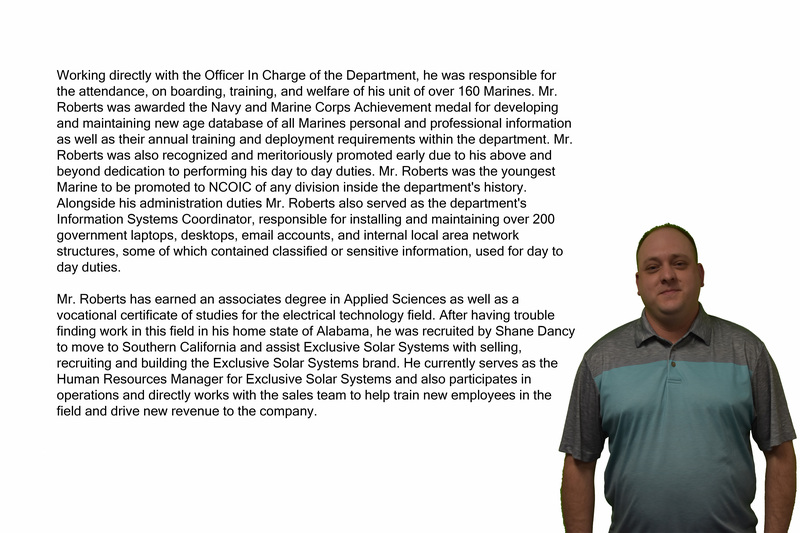 He worked closely with and developed a strong friendship with Exclusive Solar Systems CEO, Anthony “Shane” Dancy. Arthur Bell has several years of solar experience in several markets. He is well knowledged in this industry and helps by working with the team on their education. Arthur Bell has really shown Exclusive Solar his team dedication and expert professionalism with clients. He continues to excell and show team members how to do things by leading by example. The solar industry is continuously growing and constantly changing, so it's difficult to keep up with the changes. There are many companies who claim to provide the best service, but how does the average consumer understand what information is important for them to know? Most energy consultants don't take the time to fully understand and evaluate the needs of customers in order to provide them with the information necessary to make a confident decision and often customers are left feeling unsatisfied with their choice and trapped into a contract that isn't ideal for their needs. Bottom line, if customers aren't properly educated and given options best suited for their needs, it isn't likely a customer will ever be satisfied with any option they choose. The bigger solar companies find it easier to cut costs on the installation of solar systems. Cheaper labor saves them money allowing them to maintain larger margins. Exclusive Solar partners with American Solar Direct to ensure our customers get the most competent and sophisticated installation process backed by their years of solar experience. We trust their services because they have been installing solar on homes since 2007 and have a proven track record. For most Americans, our home will be the largest investment, so it is crucial in feeling confident that this investment is going to be in the right hands of professionals who care. The average acquisition cost for solar companies is 20% of the install price, which means, if a customer's system costs is $25,000, then that customer essentially paid a $5,000 “FEE” to become a solar company's customer! We consistently beat out the competition because of our proprietary marketing channels. By saving millions in advertising Exclusive Solar Systems is able to pass off these savings on to our customers by giving them unbeatable prices. We take extreme pride knowing our customers get the greatest savings possible. Our customers, not only get to be apart of our passion for cleaning up the environment but they also get to feel confident for years ahead knowing they received the best deal possible from a company who had their interests at heart.